Product prices and availability are accurate as of 2019-04-18 15:30:15 BST and are subject to change. Any price and availability information displayed on http://www.amazon.co.uk/ at the time of purchase will apply to the purchase of this product. For greater authenticity we simply barrier filtered the whisky - the method used in those far off days - and bottled at a higher alcoholic strength. The result surprised and delighted us. The additional oak influence creates a soft sweetness and velvety feel when first tasted, then the intense peatiness so unique to Laphroaig, comes bursting through. The finish is very long and alternates between the sweetness and the peat. 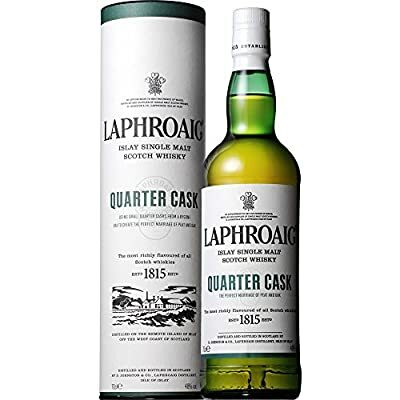 NOSE: Burning embers of peat in a crofters fireplace, hints of coconut and banana aromas. PALATE: Deep, complex and smoky yet offers and surprises the palate with a gentle sweetness. FINISH: Really long, and dries appropriately with smoke and spice.